This is Niko. 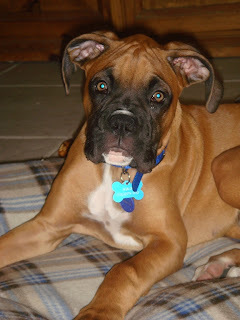 He is a baby boxer, about 4 months old. He and Buster have been buddies for a couple of months and we had the privilege of keeping him overnight while his "parents" went to Miami. Niko has learned to sit and shake, and is working on mastering stay and lie down. He is also learning to master his bladder, which we discovered when he anointed Buster's bed as we were getting ready to go to sleep. Our three cats didn't mind him much until he decided to chase them up the stairs, but we had foreseen this problem and put up a baby-gate so the cats could get a reprieve from his desperate requests to play with him. Buster was very patient, even let Niko bite his ears and steal his chew toys, but was more than a little bit relieved when it was time for Niko to go home. A year from now we will either be married or living in the Northwest. We are planning to get married in the Portland metro area, either this fall or the following spring. It will likely be an indoor wedding as Portland weather is not reliable enough to schedule outdoors. Kevin Brusett will do the officiating, Monica Elie is the Matron of Honor. Scott is working on getting his attendant list finalized. I'm compiling a guest list and it's looking bigger every moment! We're hoping to get a rough number of guests so we know how big of a venue we will need, so we can figure out a rough budget and then how long it will take to save up for it. I've picked out a frontronner in the dress department and we've narrowed down styles for Scott. I'd like the colors to be white, deep dark red, and a deep dark orange.